Who says you can't get a great deal in a 2009 model snowmobile? Surely not Polaris, which gives you a moderately priced touring sled with renowned quality, durability and bulletproof reliability. Of course, what passes for the 2009 Polaris Trail Touring DLX should be rock solid, because it is the end result of Polaris past with some Polaris present. This sled does not figure in Polaris' future, but for the here and now and US$6,599, it is a darn good value. 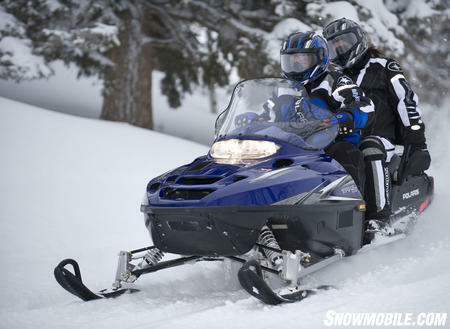 The 2009 Polaris Trail Touring DLX captures Polaris' history from ski tip to snow flap. It is one of the few remnants of the Indy legacy that drove Polaris sales leadership for more than a decade. If you want to move into the real present day Polaris line of IQ-chassis models, you'll have to ante up nearly three grand more. The base IQ trail tourer is the 4-stroke powered IQ Touring FS with another 20 horsepower, Polaris' version of rider-forward seating and a suggested base price of US$9,099. Just don't get it with the 550 fan cooled motor. It will overheat and sieze up. Not a matter of if, but when! It is a problem Polaris has known about for years. They will leave you hanging with no recourse but to shell out more money. They stuck it to me on a sled that only had 400 miles on it. When in doubt......Crank it out! That's a really nice looking sled! Too bad they didn't give it a water cooled engine. 99 Polaris Indy 500 Classic Touring. Grew up riding 760 Panther, 399 Cheetah, and early Rupp 340. I have a 2009 Polaris Indy Trail Deluxe Touring with the 550 cc engine with dual carbs. It has an oil injected two cylinder engine with 1,147 miles on the odometer. I recently took it out of a nine month storage (StabIl in the gas tank for those months). When taking it out of storage, it started slowly and smokes excessively. After I ran the engine on the trailer, the exhaust left black residue on the trailer deck and fouled the spark plugs. Is that a function of a clogged oil injector, dirty carbs or something else?